It's now 4 months till opening day for the 2014 meet. Beyond that, NYRA just announced that it's taking applications for reserved seats. I'm waiting for my "application" form in the mail. I'll complete it immediately, ask for the seats I reserve each year, and then begin the day to day countdown. OK, no surprise. I'm a Saratoga junkie as much as a Court junkie. And looking over the photos sent to me by Bob Mayberger and Adam Coglianese--as well as watching the culminating Derby preps and handicap stakes--this is March madness to the tenth power for those of us for whom thoroughbred racing is part of our DNA. Let's get to #'s 3 and 4 on the Saratoga 2013 Top Ten. 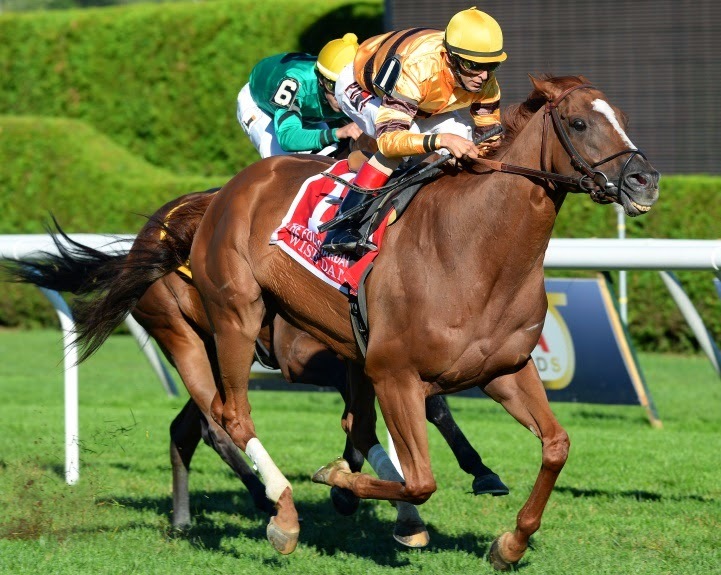 We've looked at Will Take Charge winning the Travers at #1. Princess of Sylmar winning the Alabama at #2. So now #'s 3 & 4. Two champs. This is one magnificent athlete. If this were baseball, we're talking the Mick, the Duke, and Willie. 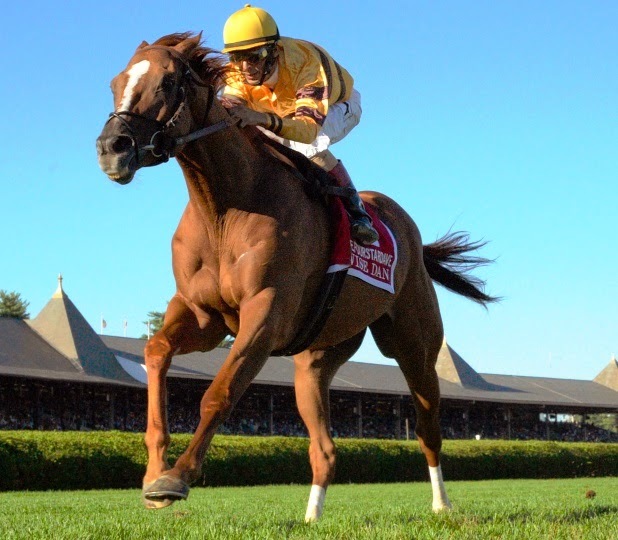 Once again in 2013, Saratoga fans got to see Wise Dan in action. This past summer, running again in the 1 mile Grade 2 stakes for 3 year olds and up, Dan came from 4 lengths behind in the stretch. He overtook King Kreesa and won by 1 1/4 lengths, with another nearly 5 lengths to Lea. Trained by Charles LoPresti, with Johnny V in the irons--just as he was in the Fourstardave the year before, and as he was in his Breeders' Cup Mile victories both years--this now-7 year old gelding is viewed by many professional handicappers as simply the very finest thoroughbred in training. At this time, reports are that Dan is being pointed to the Grade 1 Maker's 46 Mile at Keeneland in April. He won that race last year among 6 graded stakes races at Churchill Downs, Saratoga, Woodbine, and Santa Anita, as well as Keeneland. Truly one of the greats of this generation. 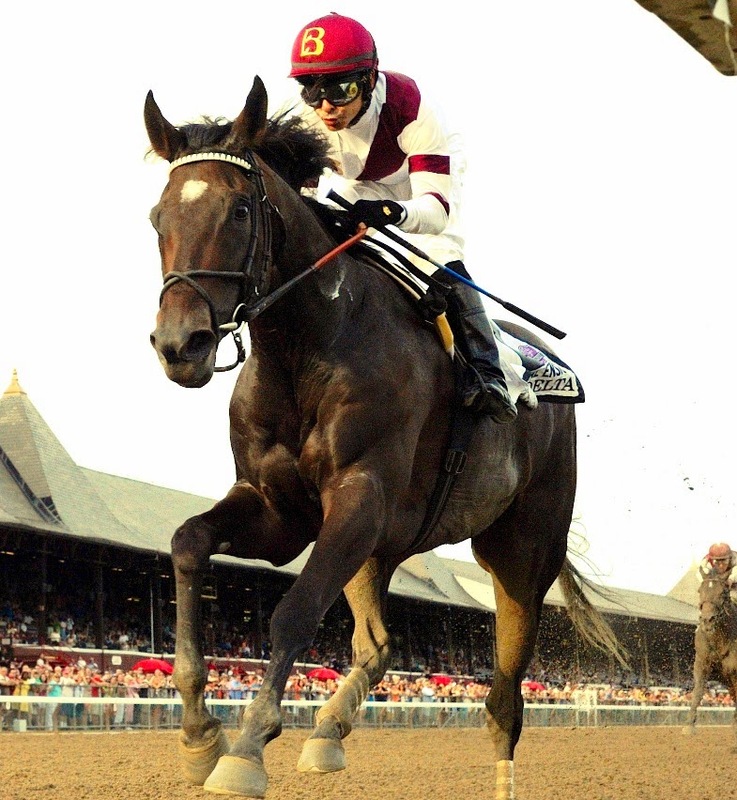 She won the Alabama at Saratoga and the BC Ladies' Classic at Churchill Downs in 2011. The Beldame at Belmont and the BC Classic at Santa Anita in 2012. The Delaware Handicap at Delaware Park and the Personal Ensign at Saratoga in 2013. Saratoga fans got to see her on Travers weekend in the 600K, 9 furlongs handicap for 3 and up fillies and mares. There was Johnny V on Authenticity and Javier Castellano on Centring. 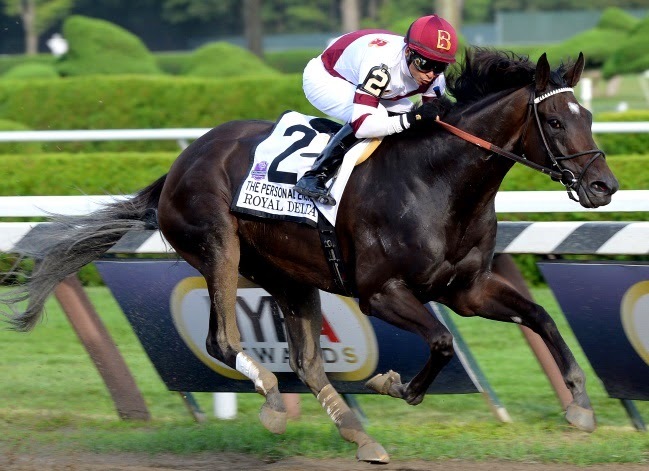 Nevertheless, Royal Delta, with Mike Smith aboard, simply outclassed the field. In the lead by 4 1/2 lengths at the stretch, the Champ glided home almost effortlessly. As Tom Durkin pronounced: "Here's a champion on display!" This now-6 year old daughter of Empire Make, trained by Hall of Famer Bill Mott, was retired in November and will soon be a Mom. What a great champ, and what a thrill to see her in command at the Spa. In the next post in this series, we'll look at #'s 5 & 6. Maybe more.